Posted in Yiddish Cowblog | Comments Off on Someone actually bought the Yiddish Cowboys string thong on the YC Outfitters (store)! Check out the feature article about Yiddish Cowboys in the Austin Jewish Outlook newspaper! Front page lead and a full two pages with color photos! Those looking to combine their Jewish and Texas roots don’t need to look any further, thanks to the Yiddish Cowboys. Founded about nine months ago by Michael Drapkin, the Yiddish Cowboys offer klezmer — or Jewish wedding music — with a twang. Drapkin, a Los Angeles native, began playing the clarinet when he received the instrument as a Bar Mitzvah gift. He attended the University of Rochester’s Eastman School of Music, then moved to New York City, where he played as a freelancer before landing a spot with the Honolulu Symphony. After a season in Honolulu, Drapkin realized he was too much of a maverick for the orchestra and in 1983, returned to New York. Drapkin had started working with computers at the end of his high school years and upon his return to the East Coast, got into programming. The Yiddish Cowboys perform klezmer with a twang last month at the JCC: Zhenya Kolykhanov (from left) on accordion, guitar and vocals; Wayne Dunkin, drums; Michael Drapkin, clarinet; and Rob Jewett, bass. Photo by Tonyia Cone.Over time he transitioned to management — working as director of technology for Avalanche, CTO of DMS Corp., a vice president at Lehman Brothers and business strategy executive with telecom upstart IDT — before founding Drapkin Technology Corp., a consulting firm with clients ranging from Gateway Computer and Sony Music to startups. While Drapkin has written for the New York Times, chaired a Columbia University program, given lectures across the country, and written, co-written or contributed to 11 books in three different fields, when he realized one day that he had not played his clarinet for a year, he felt dejected. “I opened my case and my keys were tarnished. I felt really bad and said I just missed music,” he recalled. The realization led him to do things he never imagined. He has judged music at marching band contests, was part of a chamber music group that played at Carnegie Hall, and began arranging and composing. In 1979 he had published a book used worldwide as the standard book for orchestra bass clarinet players. He had always planned on writing another volume and ended up writing two more volumes. “You can go to any symphony orchestra bass clarinet player and say, ‘Hey I know Michael Drapkin,’ and they go, ‘Oh, I have his books,’ ” said Drapkin, who is now working on his final volume. After the dot-com meltdown and 9/11, Drapkin examined what was important in his life and what he wanted to achieve. Hoping to take advantage of his classical-music and business experience, Drapkin began thinking about what good he could do for the music world. Although the number of symphonies in the country — and the jobs they provided for classical musicians — was dwindling as symphony orchestras in cities like Honolulu and Philadelphia folded, music schools were still graduating 12,000 to 15,000 music performance majors every year. “Their examinations are in repertoire they’ll probably never get to perform. They are being prepared for careers that virtually don’t exist,” he said, adding that with about 15 full-time, year-round orchestras, a musician has better odds of becoming a senator than playing in a symphony orchestra in the United States. In response, Drapkin started a movement in music higher education pushing an entrepreneur curriculum, which is what almost every other sector of the economy has done. The music world heard his message. At one point Drapkin was appointed chair of the national Committee on Career Development and Entrepreneurship for the College Music Society, an organization that represents college music faculty worldwide. Drapkin founded and presented the Brevard Conference on Music Entrepreneurship for two summers at the Brevard Music Festival in North Carolina and raised $100,000 in grants from the Ewing Marion Kauffman Foundation, the nation’s largest entrepreneurship foundation. He was also a finalist for three dean positions at colleges of music. “The problem is not my qualifications. The problem is that music faculty are scared and don’t understand entrepreneurship, even though they are content to graduate students who have no hope of being able to earn a living in the field in which they’re training,” he said. Drapkin — who, drawn to the city’s mix of tech and music, moved to Austin five years ago with his wife Suzy, founder of the Connect Forward Job Club — then founded the Drapkin Institute Inc. The Drapkin Institute empowers performing musicians to manage their careers by teaching them how to create demand and value in what they do as music entrepreneurs. The organization was incorporated as a for-profit business in Texas in January 2010. In the spirit of his work helping students come up with different ways to share the music they love with other people, Drapkin created the Yiddish Cowboys. “The Yiddish Cowboys is actually my living laboratory of music entrepreneurship that has been fabulous,” said Drapkin, who is also data integrity manager for the Texas Department of Family and Protective Services and a performer with the Austin Symphonic Band and Mid-Texas Symphony. It took Drapkin almost five years to put the Yiddish Cowboys together because he found it hard to find the right players in Austin. “Klezmer music is especially difficult music to play if you want to play it well. It requires a lot of technique and musicianship. To play it well takes really strong skills on your instruments,” he said. While judging musicians for the city of Austin’s grant, Drapkin came across the Flying Balalaika Brothers, a Russian band that plays music similar to klezmer. “What was great about it was I walked into a band that knew 80 percent of the styles that we needed to do. We just needed to learn the ‘Hava Nagila’ rhythm,” he said. Together with three members from the Flying Balalaika Brothers, Drapkin formed the Yiddish Cowboys nine months ago, with Drapkin — the only Jew in the band — on clarinet, Zhenya Kolykhanov on accordion, guitar and vocals, Rob Jewett on bass, and Wayne Dunkin on drums. “At this point, we’re really the only seriously professional klezmer band in the Austin area,” he said. Drapkin explained that since all the band members are professionals, they can rehearse and put together tunes very quickly. Next, looking for the best location to gain visibility with his target audience — Austin’s Jewish community — Drapkin headed to the H-E-B Kosher Store. Drapkin, who runs South by Southwest’s Classical Crossover Showcase, told store management that the band played at the festival and volunteered to play at the Kosher Store. The Yiddish Cowboys and the Kosher Store ended up developing a good relationship. The band played weekly for a few months and recently finalized an agreement to perform monthly at the store. Each performance will highlight an event, such as a Jewish holiday. June’s event is a Gefilte Fest. The band’s performances at the Kosher Store have become so popular, extra tables are needed to accommodate the audience. “What it did was it exposed us to the entire Jewish community because, as you know, if we performed at a Reform synagogue, then the Orthodox wouldn’t come and vice versa. Everybody comes where there’s food, especially Jewish food. It worked out perfectly,” he said, adding that aside from a little ambient noise from nearby refrigerators and lights, the store offers good acoustics. The gig has also turned into paid work throughout the community. Since they started playing at the Kosher Store, the band has received inquiries from many Jewish organizations and people planning weddings and other events. They have played at many events, including Central Market’s Passover in the Hood, Chabad’s Purim festival, and Israel Independence Day at the J.
Drapkin said that the Yiddish Cowboys have turned down requests to play in bars because they are very focused on targeting Austin’s Jewish community and know that this audience is not likely to follow them to places like country and western bars in South Austin. “For now I’m very happy for us to be doing what we’re doing, building up a really good reputation here in town and providing really good quality Jewish music to our community,” Drapkin said. 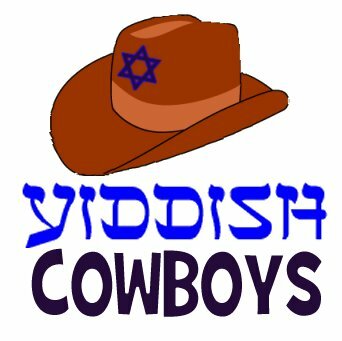 Those interested in more information about the Yiddish Cowboys and their performance schedule can visit www.yiddishcowboys.com. Posted in Yiddish Cowblog | Comments Off on Great article in the Jewish Outlook! They’d love to give you a discount on diamonds and gold. Mamas, don’t let your sons become Yiddish Cowboys. Doctors and lawyers just like their big brothers? They should be at home, not living alone. Home with the ones they love. swimming in the Rio Grande. Hirokosan can’t believe what he hears, and asks for more information. Posted in Yiddish Cowblog | Comments Off on Nu?? ?